We can build our own tool bar layouts or add shortcuts to frequently used Arduino commands to the Visual Studio user interface. 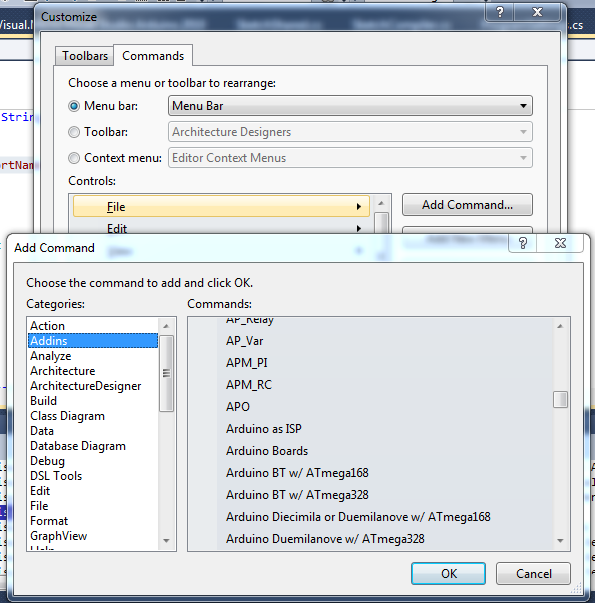 Right click any Visual Studio tool strip and select "Customize" which will on the bottom of the right mouse menu. When the Customize window opens (see below), click keyboard to assign shortcut keys. Click the "Commands" tab to add commands to menus and tool bars. Below you can see the possibility to add Arduino commands such as board selection to the "File" menu. Warning: On rare occassions Visual Studio becomes confused and which causes visual micro menus and tool bar controls to disappear. The documented solution for this problem is to use the visual studio resetaddin command. Running this command will remove any customizations you have made that reference visual.micro macros. I am not currently sure if it is possible to backup your customizations of the visual studio ide. The safest way to work might be to create a visual studio macro that creates the arduino buttons, shortcuts and menus based on visual micro micros. Doing so allows you to re-run your macro and re-create your customizations at any time in the future.